Word has slipped out that Sony's new PlayStation motion controller will be called Gem, a name that industry observers around the world are saying is truly, truly, truly outrageous. The beans were spilled by Electronic Arts CEO John Riccitiello, who said at the UBS 37th Annual Global Media Conference yesterday, "In the coming year, both Sony and Microsoft have announced new controllers. Motion sensor controls, Natal and Gem, these are likely to bring new consumers into the marketplace." Many analysts have said the name is both exciting and adventurous, while one industry executive who wished to remain anonymous claimed it was "glamorous [and] fashionable" and could bring considerable new fame to Sony's console. "No one else is the same," he added. Excitement over the newly-christened controller isn't entirely contagious, however; Microsoft has issued a statement affirming its commitment to the rival Natal controller, which it believes is a superior technology. "We're Microsoft!" the company said. "Our controller is better!" SCEA Director of Communications Patrick Seybold has since issued a follow-up statement sucking the fun out of everything. 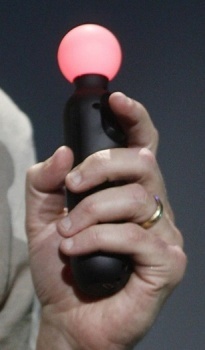 "[Gem was] an early code name for the product," he told Kotaku. "We haven't announced [the] final name at this point." Ah well. It was truly outrageous while it lasted.